Florian and I have not been getting as much of a chance to go hiking lately, so last weekend, when we both had a day free, we made the most of it with a trip to the Harpers Ferry Outdoor Festival. Florian knows how much I miss my West Coast music festivals like Seattle's Folklife Festival and the Oregon Country Fair, and sadly we will not be making it to the Zimbabwean Music Festival this year, so he thought this would be a good way to make up for those losses. The festival was at a farm property near Harper's Ferry, WV, and is a benefit for river conservation and environmental awareness surrounding the Shenandoah River. town, but because the cliffs surrounding it, and the town itself, afford incredible views of the confluence of the Potomac and Shenandoah rivers. Including a delicious little cattle dog. So we decided to go into the town and walk around before coming back to the festival for music in the afternoon. It is a town of steep hills and tourist shops, and the Appalachian trail runs through it so you often see fit young people with big backpacks. from whence you have an incredible view of the town and the cliffs above it. that is spooky and beautiful. I love ruins, and had no idea this one was there. 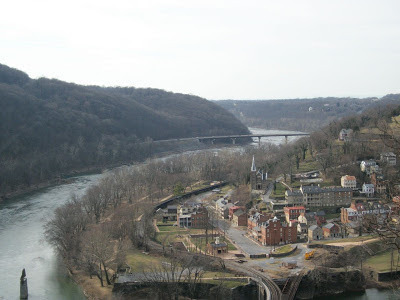 For an American History buff, Harper's Ferry is a really cool place. I always found American history to be troublesome and painful to think about--maybe it has something to do with little things like the wholesale slaughter of Native people, and, ya know, stuff like slavery, religious zealotry, starvation, and smallpox--but I'll always love a nifty ruin. where some of the stones had barely legible dates in the 1700s. The music was going to be getting started soon, so we headed back to the festival to check it out. We didn't bring our dogs because it was a hot day and we didn't want to drag them through town and to a festival, but we hadn't realized how dog friendly the festival would be. There were a bunch of dogs just milling about and socializing. This one big brindle boxer thing was just wandering all over, cheerfully sniffing around. He wasn't much interested in meeting us but he really wanted to meet all the other dogs. We watched him play with a couple other dogs and not once did we see him raise a lip, bark, or seem put off in the least by anything. We had a great time dancing to On the Bus, one of the scads of Grateful Dead cover bands in these parts, and then decided to head home to our less well-adjusted but very beloved pooches. Not bad, for a day spent away from them! What a beautiful place! I love history but like you find it sad, still those are my favorite kinds of places to learn about history. It gives you a sense of the magnitude of what went on there. that is so scenic and it looks like you had a great time! Ah Kirsten...Grateful Dead??? We know that in your heart of hearts, you're a PNW kind of girl. Vancouver also has a Folkfest. Maybe you could visit Seattle and Vancouver. I love places with a lot of history! It sounds like a great outing, even if the dogs didn't get to come along. 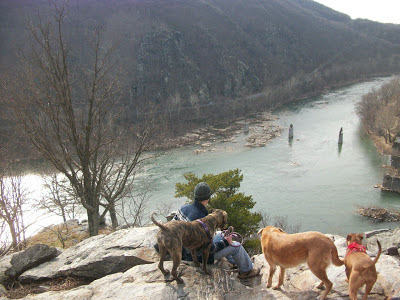 Beautiful, I love Harpers Ferry. We went there so many time when I was a kid. It is the best in the Fall when the leaves are changing! Yes, dude man, I thought of you, as I always do when I see one of the scads of Dead-type bands around here. Funny, I'm surrounded by them now and when I lived in Portland I barely had my finger on that particular pulse. Though I'm sure there are even more of them there! Hope to see you SOON--give those kids a squeeze!